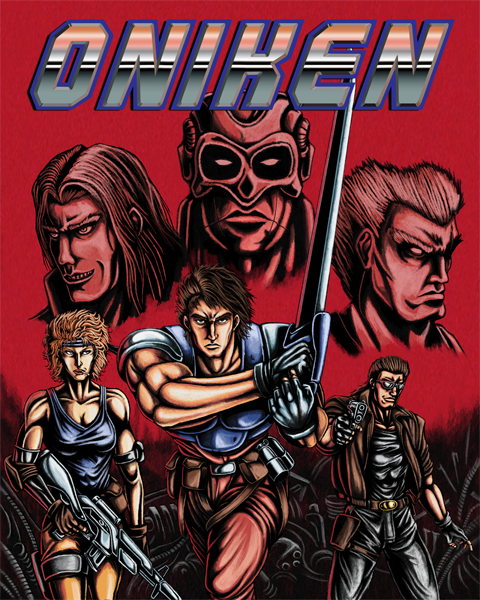 Oniken is a 2D platform action indie game that make use of 8-bit graphic style. My friend Pedro Paiva and I are putting a great effort to guarantee that this game feels really like an 8 bit classic. Everything on Oniken, from the character design to the music, is a tribute to the 8-bit action games from the NES era. So if you like old-school games be prepared for Oniken and remember... Oniken is NES hard! By purchasing Oniken, you will also get with no extra charging Oniken´s Manual and Original Sound Track composed by Thommaz Kauffmann, Bruno Araujo and N-Freq. *** Mac and Linux version uses wrappers. They're not a port, however in almost every machine that we tested the game it runs without any problem. However if you had a problem please e-mail us! Hey Everyone! Odallus demo is out and wee need your help! It has been a while since we released Oniken, now we're making a new game, Odallus: The Dark Call. We hope that you guys enjoy this game as you enjoyed Oniken! Thanks to everyone! Hey guys, we're happy to announce our new game! It's called Odallus: The Dark Call a dark fantasy themed action/exploration platformer! Solving "cannot create subdirectory in temporary directory"
Hey guys, we fixed the "cannot create subdirectory in temporary directory" problem that some people are having! Vote Oniken up for chances of win win! Same game available here on Desura but with achievements! Hey guys! Mac and Linux versions are done! We're going to release it here as soon as the files be authorized! This is the Demo version of Oniken! Now you guys can experience a part of the final game release. Awesome game! Enjoyed the demo & decided to download it from Desura. I will support any developer that releases quality retro games. Just beat Oniken. Very entertaining game! I'm looking forward to Odallus. Congratulations on getting greenlit on Steam :) I think the game deserves as much attention as it can possibly get. I was wondering if people who bought it on Desura would also get a Steam key when one's available, or would they have to buy the game anew on Steam? im wondering the same thing does anyone know anything about this? i use ps3 with xpadder, also tried xinput, nothing works but those progs recognize my dpad. Hum... I'm using DS3 Tool to play using my ps3 controller. Oniken reconizes the dpad with it. This game is really awesome! Nice and charismatic 8-bits graphics mashed up with great soundtrack and gameplay. It's dificult, yes, but in a very, very addictive way. Nostalgic and yet somehow unique! This is one of those games where you get better the more you play it! Then the ironman runs become more fun and better. "Save this powerup for here, theres a pickup there, planning ahead"
RT @TheArcadeCrew: @JoyMasher *Press F* See you up there, mischievious pal.